We love to get the detail from the driver’s seat. Andy Wallace has been carrying out his duties longer than most, and his view of a race is always a very good read. We ask other drivers for their view of an event too. 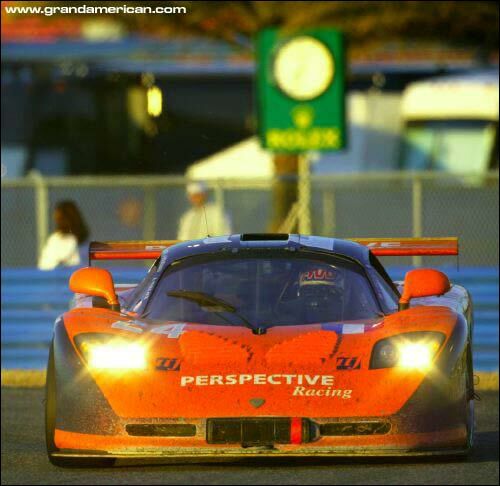 A drive in the Perspective Mosler at Daytona: Andy explains how it came about, and what happened along the way – to a Rolex. I’ve been friends with Michel Neugarten for a long time, which was very useful – as I didn’t have a clue what car to drive at the Rolex 24. For 2003 of course, all the traditional Prototype machinery had been effectively outlawed. I suspected that most of the new Daytona Prototypes wouldn’t be really ready to take on the challenge of the 24 Hours….and I thought that the GTs would be too slow! 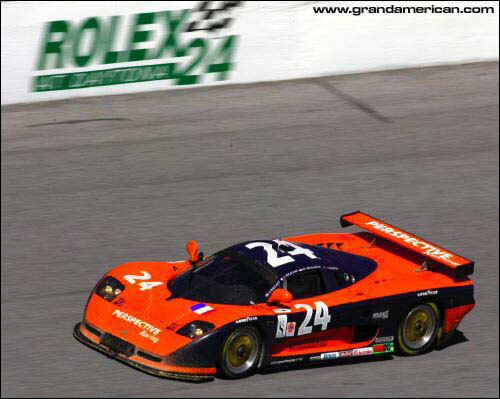 So I was fortunate that Michel helped me to find a drive with him in the Perspective Racing Mosler GTS. 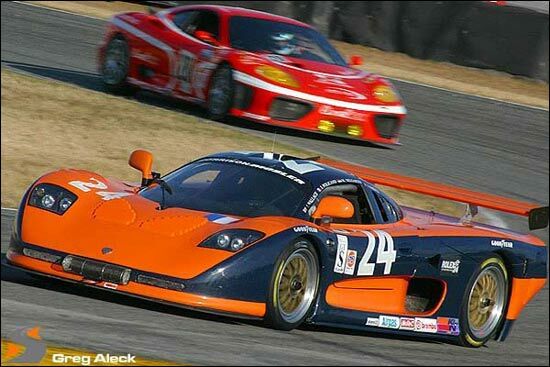 Another friend, Tony Dowe, a sports car racing genius, also suggested that a Mosler would be a good bet. So everything fell into place, but track time was going to be limited, as I didn’t go to the Test Days. So Thursday at Daytona was going to be my first chance to drive the car, and the nice thing was that I slipped into it and fitted perfectly straight away: it wasn’t like sharing with James, Butch or Chris Dyson, who are all about five feet taller than me! It was immediately apparent that the banking was going to be a problem, but the reasons why need a little explaining. I’ve only driven a prototype around Daytona (until this year), and the banking is easily flat-out in something like a R&S. But for 2003, with all the regs. 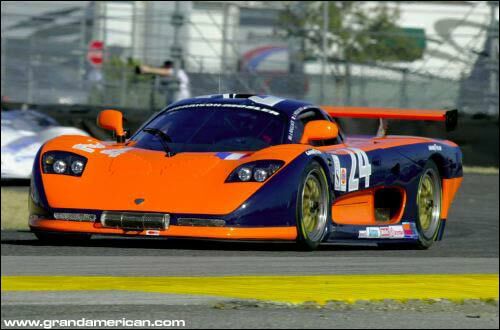 changes, we were obliged to run a ‘spec.’ rear wing on the Mosler, which was tiny. In fairness, if GA had left the GTS cars as they were, they’d have been faster than the DPs, so this was a cost effective solution. Anyway, it was the same for everyone. Perspective ran the car with the small wing at the Test Days, and told me there had been a high-speed oversteer problem. For race week they had fitted a rear diffuser and changed a few other bits & pieces. I did a few laps and then had a think about it: I couldn’t believe how bad the car was on the banking. It took 100% concentration to hang onto it if you wanted to stay flat (and who’s ever heard of lifting off on a straight!?). The rear end of the car had a mind of its own - bucking and weaving all over the place. It took everything I know to stop it from smearing itself along the concrete wall, which at 180 mph is pretty exciting… Five laps like that is not a problem, but it’s not how you want the car for the 24 Hours. The team were on the case: they changed ride heights, shocks, springs, and a few other things to try to improve high-speed stability. The car was immediately better on Friday, but then our running was cut short by an engine problem. That introduced a typical ‘Daytona’ factor. If everything runs smoothly there isn’t a problem, but when you are up against it time wise, you’re in trouble. The track closes at around 5 or 6pm each day, and re-opens at about 7am the next day. Even if you’re struggling to get everything done in time, there are no exceptions. It works well for NASCAR. They have a busy season of over 30 races, and by locking the track at night they save the mechanics from meltdown. But it doesn’t work particularly well for a 24 hour race, when teams are struggling to prepare the cars in time for nearly 3000 miles of racing. There is a part solution; you can load the car into the truck, take it outside the track, and then work on it in a hotel car park… Not so easy when you consider the engine and gearbox are lying on the floor and the truck is buried deep in the paddock! The team were preparing the car right up to the start of the race. We only just made it. My teammates, Jerome Policand, Joao Barbosa and Michel Neugarten, are all experienced drivers, and did a great job in the race. But none of us had driven together before. Pit stops were going to be a challenge, as we’d not had time to properly practice driver changes. There was too much going on around the car, and four drivers jumping in and out would not have been a welcome addition! So going into the race, we didn’t really know if the car was going to like being flat out around the banking or not. Jerome would be the first to find out the answer to that one, as he would be starting the race. Anyway, the mechanics had done well. There were no oil leaks, and mechanically everything was fine. At this point I need to explain about the HANS (Head And Neck Support) device, which is mandatory in Grand-Am this year (and in F1), because it determined the driving order. I have to admit that I really don’t like wearing the thing. No, I hate it! I believe Nick Heidfeld has made it clear that he doesn’t like it either. In a multi-driver race, there are even more problems with it. I’m convinced that in a race with driver changes, we shouldn’t be forced to wear it. The first problem is getting the seat belt shoulder straps correctly positioned in a hurried driver change (bearing in mind the limited access into the cockpit, the heat, the lack of light at night, and the clock ticking away). More often than not this doesn’t happen, rendering the device next to useless. Then if it does happen to get positioned correctly, you can’t turn you head and so can’t see in the mirrors. Not at all satisfactory, then. And as if that isn’t enough, I wouldn’t imagine you’d be thanking the inventors of the device when you’re upside down and trying to get out…! Enough about the HANS device! We only had two HANS devices between the four of us in the team (sorry - mentioned it again!). You get into the car with it already attached to your helmet, so we would have to swap them about between stints. But to complicate things further, there are two different types of helmet fixings. We had one of each type, so we would have to ensure the driver with one type of helmet fixing took over the driving duties from one with the other type. Are you confused yet? Do you even care? Anyway, Jerome started, Joao went next, Michel third and then it was my turn. Was it OK on the banking? Jerome confirmed that it was, so that was a good start. When I jumped in for my first stint, the car felt a lot better on the banking, but it was still easy to touch another car up there if you dropped your guard. Through the infield the grip and traction was good on fresh rubber, but you had to be careful on the throttle towards the end of the tyres’ life. The more I drove the car, the more I began to understand its quirks. By the time I jumped in for my second go, I was really enjoying the experience. One thing that hurt us in the early stages of the race was the driver changes. We lost a whole minute in the first one, getting everything done. Then a few times early on, we’d make a stop under green – only for it to go yellow a lap later! So for the first few hours we were struggling a little, although we weren’t losing out on speed on the racetrack. Our fastest lap was within a second of the best lap of the race – which is a tribute to the team, who gave us a car that could lap that quickly, after the problems we’d had. Then the gearbox went – or more precisely, the diff. exploded. When was that?…well it was dark, and I think it was the eighth hour. We were fourth at that stage, within three laps of the lead and about to take third. We’d had a good clean race so far, and we were still on target. The new engine had been very tight at the beginning, but now every time I got in the car, it was pulling more rpm on the straights, and the lap times were improving. We didn’t think the transmission was going to be a problem at all, and the shift quality was fantastic – but there we were behind the wall, and we lost over an hour. We were 30 laps down, and in about 20th place. Through the night, the engine was running a bit too cool. We had a bit of a problem with the radio, so somehow the message never did get passed on to tape up the radiators. This caused a slight loss of coolant, and once the sun came up the engine temperature went off the clock. This was a real blow, as during the night we’d managed to haul ourselves back up to 5th or 6th overall. Suddenly we were behind the wall again, losing 15 minutes or so. We felt that we’d probably lost a possible GTS win then, but of course you never give up. We got our heads down, got up to second in class…and then the lead Morgan Corvette had its own problems. I was in the car for the final 75 minutes, and with the radio problem, I wasn’t exactly sure how fast I needed to go to win. By now the gearbox had completed about the same distance as the one that had already failed… I was being very careful changing gear, and was gently getting back onto the throttle afterwards. I could partially hear radio messages that seemed to be telling me to go a bit slower. By this point the lap times weren’t showing on the dash any more, so I continued at the same pace using everything I’d ever learned about conserving a racecar. After passing the wounded Corvette a couple more times, I was sure were we safe. So a GTS win it was! It’s difficult for me to judge what the race looked like from the outside. Sure there were less cars than in previous years, but there was quite a lot of squabbling for position. The GT cars were slower than us on the banking, but not by much. The DPs were slightly faster, but we were all within ten to 15 mph of each other. Instead of flashing by the GT cars, you really had to work at it. When you caught five or six GTs in a bunch, it would take quite a few laps to consign them to the mirrors. The DPs definitely make the top category cheaper. If this helps more teams to compete, then Grand-Am have done the right thing. They’ve stuck their necks out, and I hope we will see more cars on the grid as the year progresses. One thing’s for sure though, another hundred horsepower would help. The top category should be exactly that, and should have a bigger performance advantage. Never mind – I added to my Watch tally. 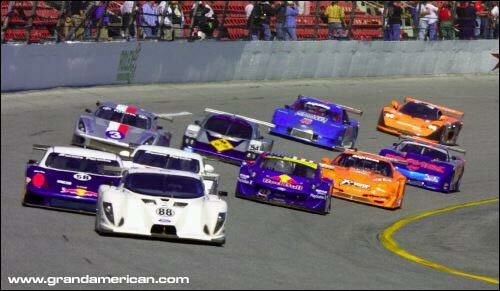 Next year I’d like to drive a Daytona Prototype, going for the overall win. Sebring is next of course, with James and Butch in the Dyson Racing MG-Lola. James managed to go quicker than the 2002 pole time in the #16 car at the team’s last Sebring test, running with the smaller 2003 restrictors. It’s clear that Dyson Racing have made a lot of progress recently, with help from engine wizards AER. They are great to work with and so enthusiastic. We’ve been working hard on reliability too, and I really think we’re now in a position to take on the LMP900s in qualifying and race trim. Chris Dyson has come on strong recently too, so don’t count out the second car. Anyway, a very good start to the year, and a Rolex watch too. 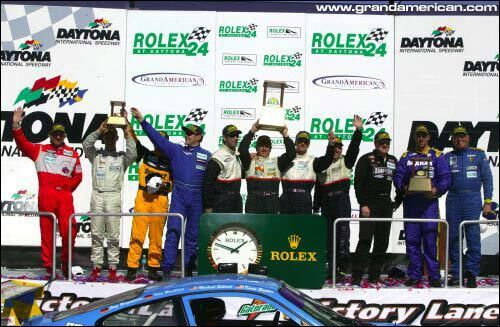 I saw Johnny Mowlem at Orlando Airport, and he seemed rather put out that he’d finished second and didn’t get a watch, and I’d finished ninth and did, for the GTS win. Johnny, got the time mate?